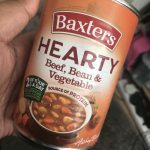 When I was asked to participate in Baxter’s ‘Souper Swap Challenge’ I was excited at the prospect of taking part and having lunch for two weeks. 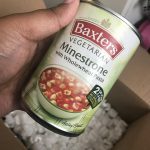 I was sent a mix of meat and vegetarian soups and the idea was to ditch the sandwiches in favour of healthy, hearty soups. I must confess I’m not the biggest soup lover but this winter has been cold, I feel a little old so when I’m faced with a challenge I do my best to be bold. Although if you’re after just hearty or vegetarian options, those are available too. You can purchase them here and take part in the challenge too! Quote SOUPERSWAP at checkout for FREE DELIVERY! 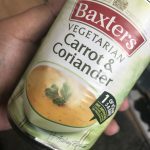 But if you’re not sure which one to try or would like to try something different you can can take Souper Swap Quiz to find out here. ‘I’m so used to spending £6+ plus on lunch and still feeling hungry afterwards’. 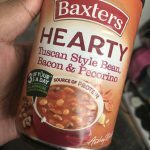 Tucking into the Tuscan Style Bean, Bacon & Pecorino Soup made me realise that I didn’t need a sandwich, crips, chocolate bar, fizzy drink and the rest of Pret to eat for lunch. A bowl of it was enough, not to mention how tasty it was! ‘What can I do to add a little fun into this?’ The Tomato, Chorizo & Mixed Bean Soup was probably my favourite one as I don’t often have chorizo. I added a little cheese, salt and pepper with a bread roll just for an extra oomph. You can also find some more ways to pimp up your soup here. A ‘Great after gym meal’. There were some days where I decided to mix it up and have a soup for dinner instead of lunch. These made a great after gym meal as all I had to do was heat them up, grab a spoon and dig in. I went to bed feeling full but not lethargic which is great in my books. The best part of taking part in this challenge was taking myself out of my comfort zone, trying new things all whilst eating something healthy. If you’re not familiar with Baxters, maybe you’ll be a little more inclined now. Their soups are healthy, affordable and best of all tasty! Perfect for those Winter days (or nights) when you don’t want to ‘cook’. 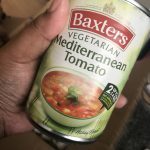 I am no longer afraid of soup and with me trying to be on a the path to a healthier lifestyle, I will definitely be reaching for Baxters on my next food shop (not those dodgy soups where you just add hot water). Please note, these products were sent for my review but all opinions are my own. "Musings: My Non-Alcoholic Night In"